We at Pirina thought we would delve into the history of jewellery a little bit and give you a few interesting facts about the evolvement of our favourite and most treasured accessories. Throughout human history, irrespective of religion race or culture, jewellery has existed as a form of personal expression, wealth and social status. The first pieces of jewellery were made from natural materials, such as bone, animal teeth, shell, wood and carved stone. Factors affecting the choice of materials include cultural differences and the availability of the materials. While the materials and techniques used to manufacture jewellery have in many ways evolved, there are also a number of similarities with the very first forms of jewellery worn some 100,000 years ago. During this time bead necklaces constructed from shells were strung together with twine, effectively acting as charms. Necklaces and bracelets constructed from the same components and serving the same function are still available today. While new trends such as charm bracelets, chandelier earrings and stack rings dominate today’s jewellery fashions, their origins in terms of both components and design can be traced back through both ancient and modern history. Tell us about your history with jewellery through Twitter, Facebook or our blog page. We recently watched The Great Gatsby and now the girls at Pirina are all swooning over our 20s elegance trend this season. So much so, that we're getting ready to flaunt our glamorous selves and accessorise our party outfits with our favourite key pieces ahead of the christmas party season. Pay homage to the fantastic 20s era with our variety of beautiful rustic gold necklaces, earrings, bracelets and pearls to adorn yourself in for a touch of luxury and 20s elegance. Add this big sparkly Rosie Fox Vintage Gold Crystal Cocktail Ring to your look for the ultimate statement style. Go all out Hollywood in a glamorous dress for a celebrity inspired look and add this pretty Hollywood Necklace adorned with jewels and pearls. For a subtle 20s look try these fabulous rustic gold Ice Petal Drop Earrings. A timeless but pretty accessory that will instantly dress up any evening outfit. Pearls make the perfect instant pick me up and add style to any look. Try this Era's of Elegance Pearl Bracelet for a chic and effortless party style. For a complete 20s look, don't forget to dress your hair up too. Add this beautiful boho inspired Multi-Coloured Peacock Feather Haircomb to your hair and get ready to dress to impress this party season. 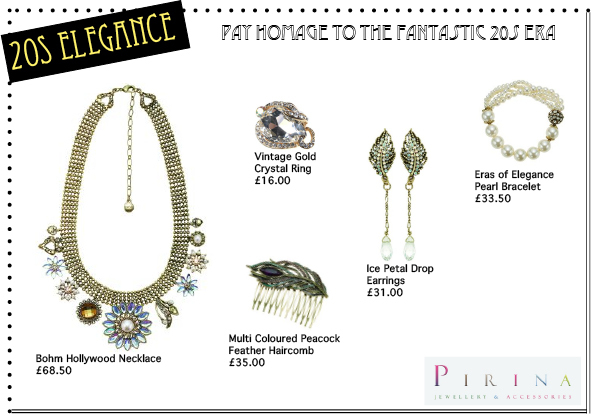 View our 20s Elegance pinterest board here for more inspiration and our party favourite jewellery this season. Tell us what you think of the trend and what accessories you'll be wearing during the festive period by joining us on facebook and twitter. We at Pirina love to party and we are all very excited that the congested party season is approaching. Yes, it’s Christmas where we mingle with work folk, dine with our loving families and dance with all our favourite friends. As always we want to make a statement throughout, be the talk of the town, the centre of the party! How to do this though? We think we can help as right at this moment we have some oh so sparkly hair accessories to delight you all. This elegant Crystal Cockatiel hairclip will certainly catch the eye of those around you by adding some winter glamour to any classical inspired outfit, as will this delicate Crystal Dragonfly hairclip which can be the jewel on your crown. If you are after a little more colour we are also proud to offer this Art Nouveau Butterfly hairclip, this will twinkle and glisten as you flutter your way around any get-together. There is also our twin Forest Deco clips which will help add some 20’s inspired elegance to your look. Or how about our very favourite Multi Coloured Crystal Floral hairclip, this vintage inspired beauty also recently featured in Now Magazine. This is certainly one item the Pirina team will be fighting over to show off at our latest shindig! Of course if your hair is already fabulous enough then you can wear all these items as brooches as well, how very versatile of this gorgeous Rosie Fox collection. 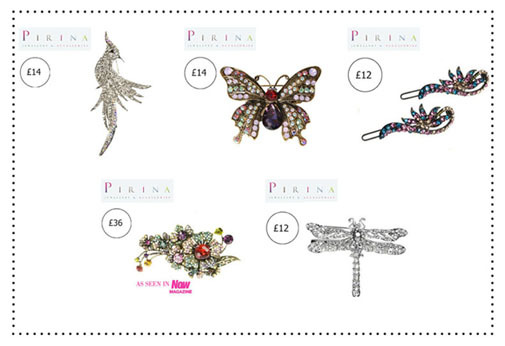 Let us know what you think of our range of hairclips and brooches through Twitter, Facebook or our blog page. Happy shopping!